The quick and easy guide to backup your LinkedIn, Facebook, Google+, Twitter & Pinterest accounts like a boss. My Twitter account was once suspended by accident, during which time I had no access to it at all. The Recruiting Animal had his Twitter account stolen/temporarily taken away from him. I know people who’ve been banned by Facebook, or hacked on Twitter and more, and like any other business, websites can go offline or even shut down, taking your information with them. Wouldn’t you want to have backups so you could restore the information later, or upload it to other sites? Here’s how to protect yourself on the major social networks. 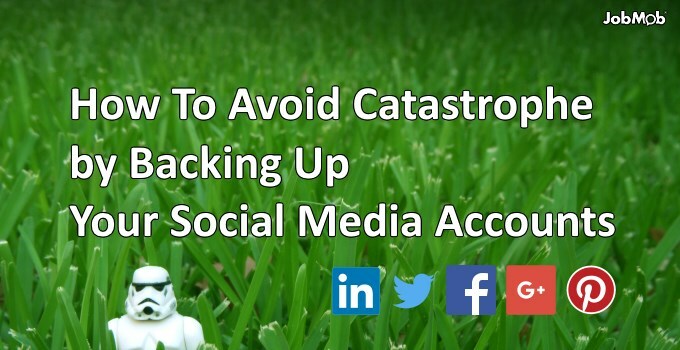 Have you ever backed up any of your social media accounts? The LinkedIn export tool lets you download all your connections' data in addition to your profile. Click Settings (Gear wheel at the right). From the Advanced Settings Section, click the “Export LinkedIn Connections” link at the right corner of the page. Fill in the captcha information and click Continue. I chose “Microsoft Outlook (.CSV file)”. The result included Title, First Name, Last Name, E-mail Address, Company, Job Title and much more. Hover your mouse over the arrow beside “View profile as” and then choose Save to PDF from the choices. You can export anyone’s profile as PDF. When you visit their profile page, look for the “Send InMail” or “Send a Message” button instead of the “View profile as” button. The entire profile gets exported, including skill endorsements and recommendations, but only the latter are credited. When your download is ready, we'll send an email with a download link to the confirmed email address associated with your Twitter account. This is to block people from downloading someone else's twitter archive. Once you receive the email, click the Download now button to log in to your Twitter account. Twitter will then say ‘We've texted you a login verification code.' Once you type in the code, you'll be able to download a .zip file of your Twitter archive. Unzip the file and click index.html to view your archive in your default browser. If you would like to keep a backup of your DMs too, Twinbox is a free Twitter client that installs as a plugin for Outlook and lets you manage your Tweets like email, keeping copies of everything you tweet, DM or are mentioned in. At the bottom of the General Account Settings page, click the “Download a copy” link. On the Download Your Information page, click the Start My Archive button. You may be asked to “Please Re-enter Your Password”. The “Request My Download” alert box will appear to warn that the archive will take some time to compile (depending on how many photos, wall posts, etc. you’ve put on Facebook) and you’ll need to click its Start My Archive button. Finally, Facebook will tell you that you’ll get an email when the archive is ready, and you still need to click the Okay button to start the process. Sounds good but the last time I tried it, no email ever came, so I wasn’t able to download the archive. And as a relatively light Facebook user, compiling that archive should have taken no more than a few minutes. Google Takeout is the official way to backup information from Google+ and other Google services like YouTube or Picasa. By default, everything is selected but you can toggle each service such as if you only want your Google+ stuff. Either way, choose what you want to backup. Click Next at the bottom of the list. Choose your archive's file type and whether you want to download it or save it in the cloud. Then click “Create archive”. Once download is done, you can Manage archive or Create New Archive. Frankly, it works great. The ZIP file is very logically organized and the files are named very clearly in it. My only complaint is that not many non-techies are going to know how to get information out of the JSON files exported from Google Profile and Google Reader, but the Google+ export files are in other, easy-to-read file formats such as VCF or HTML. All the above options are free but as you can see, they don’t always work or even back up everything there is to backup. That’s where paid services come in. Which of your social network profiles is most important to backup? Tell us in the comments. Subscribe to JobMob via RSS or email and follow me on Twitter for more social media job search wisdom. There’s also http://www.frostbox.com social media backup – it automatically backs up facebook, twitter, linkedin, gmail, flickr, instagram, foursquare and even vimeo. I followed your instructions to back up my Facebook account. Unlike your experience, I did receive the email from Facebook, with a link to log back into Facebook and download the file from there. It was a large file – 88 MB. It gave me a long list of my messages (in a Wordpad-esque format, mind you), my wall posts, and all of my pictures. The pictures are the best part. Thanks! Ilan- well that is good news. I didn’t receive the email on my second attempt either. Maybe they want you to use Facebook more! The only operational and fully functional Pinterest backup service that I know of is my company, Pin4Ever. With a click, pinners can download a copy of their boards, likes and pins to their computers using our service. The links to the sources are also saved, plus customers can search their own pins. We’ve saved almost a million pins now since our start in September 2012. Everyone gets a free backup right now at http://www.pin4ever.com, and we offer plans ranging from a single backup for 99 cents to unlimited backups for 12 months for $19.99. If you need to backup a LinkedIn group then there is Personalgroupware. They’ve been backing up Yahoo groups since 2003 and have recently offered LinkedIn group backup & transfer.